For some reason there seems to be an underlying belief that we must not feel certain ways and think certain ways. That some ways are bad and some are good. I do agree that some things are helpful and some things less helpful, however there is a reason for your suffering, and the reason isn’t that something is wrong with you. Some thoughts and feelings can be scary. Just because we are having these thoughts doesn’t mean we will act on them and if we can mindfully observe our thoughts and be curious about them, we become more skilled at not becoming immersed in them. Many people try to stuff these thoughts and feelings away and think if I don’t entertain it, it will go away. There is also concern about entertaining it too much, and becoming one with it, and immersed in it. This comes with increasing the emotional tolerance to observe it and having compassion and curiosity about it. Even suicidal thoughts serve a purpose and when understood and met with compassion, the thoughts decrease and do not become overwhelming. 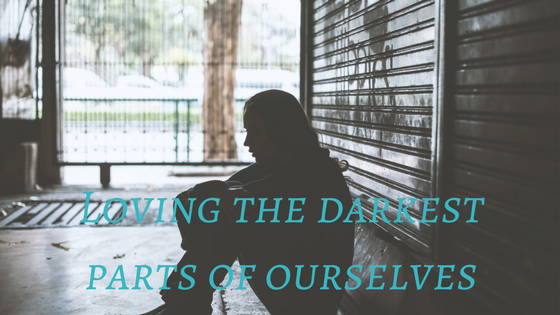 How is it possible to have compassion for these dark places? Usually the process starts out slowly because depending on your age, these internal systems have been working on auto pilot for quite some time. Therefore it is going to take a while to sort out the intricate foundation that has been laid in the mind and body. But know this system was built for a reason. It had an important purpose at one time in your life. It’s just that now the coping mechanisms are starting to cause other problems, so the system just needs some re-working and tuning up really to fit what your life looks like now, vs. what it was before. Increasing our ability to feeling calm is paramount in this process. When we numb emotionally we numb out the calm too. Thus emotional exercises are recommended. When things start to make more sense, and you feel better you now have more agency to dig in and provide compassion for these wounded parts of self, making room for healing. This folks, is the process. It’s a difficult one and takes a lot to “go there.” If you want the amazing things in life, love and connection, happiness and joy, then working through the dark places are essential. Otherwise you’ll be left with an internal battle competing for space, instead of a community filled with diversity that always comes together in the end.